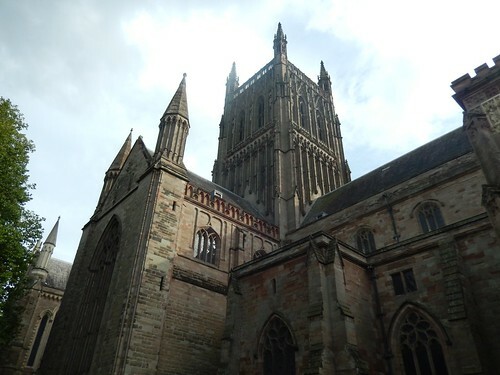 I can’t remember exactly where we parked – I wasn’t driving and I wasn’t the one who had planned it – but we ended up a good ten-minutes’ walk north of the cathedral, close to CrownGate Shopping Centre. It was one of the cheapest pay-and-display car parks available. 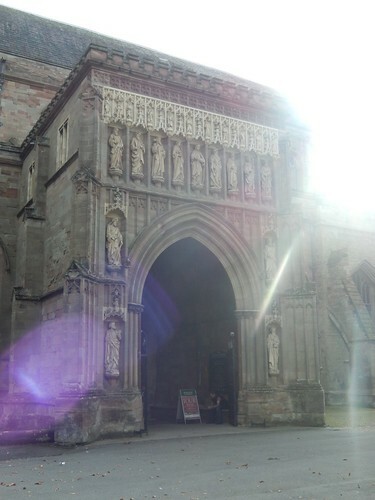 We passed a chapel and a small church, following the pedestrian signs towards Worcester Cathedral. 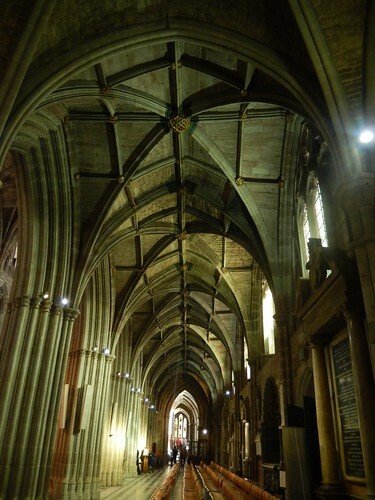 Like most other cathedrals, the architecture was impressive from the outside. 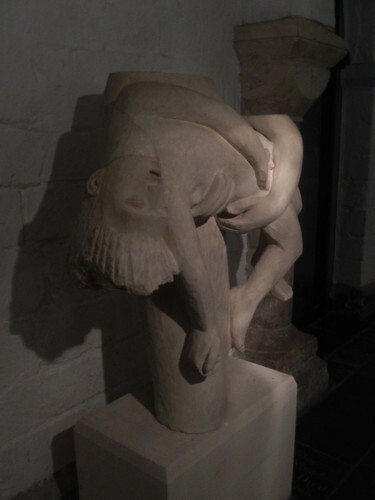 Although we’d arrived close to rush-hour on a Saturday afternoon, the place seemed much ‘less busy’ than we’d previously experienced at Salisbury Cathedral, a few months earlier [strangely, I cannot find my own blog post on that visit, which suggests that I did not write one?!]. 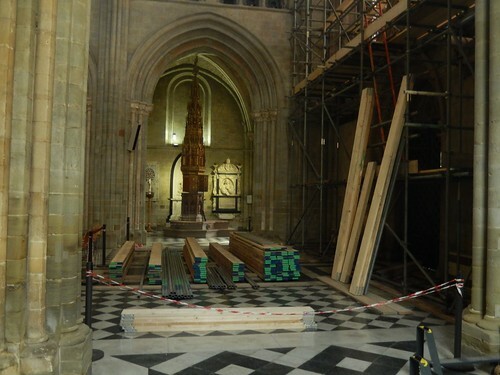 I got a bit excited when I found these stacks of wood at the northern end, where work was currently under way. I couldn’t see what was being done, beyond or above the scaffolding. I hope the wood was something fitting, like oak. Although, it could easily have been an imported species, like iroko. 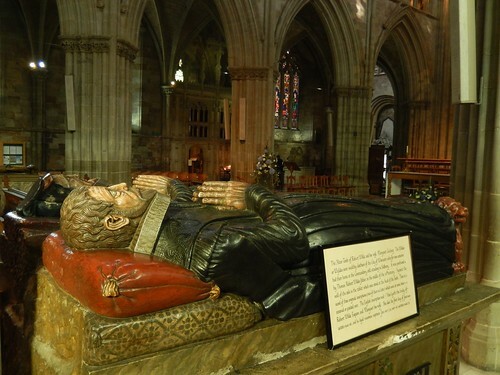 There were a couple of known figures who were laid to rest within the cathedral – I want to say King Arthur was wrong but, I know that’s not correct… I wish I could remember. 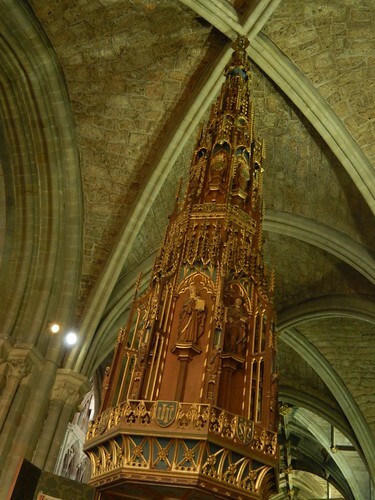 To confirm my own thoughts, I’ve just read that the architecture, here, features a mix of Norman and Gothic architecture. 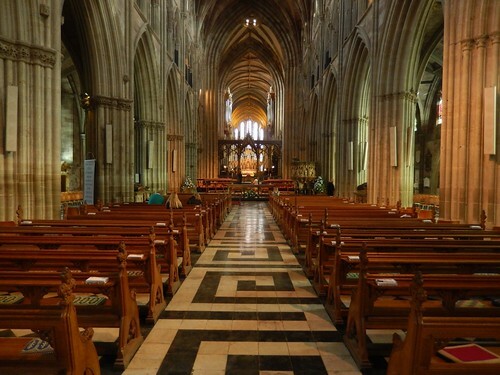 Also, Worcester Cathedral was founded in 680 AD, as a priory. 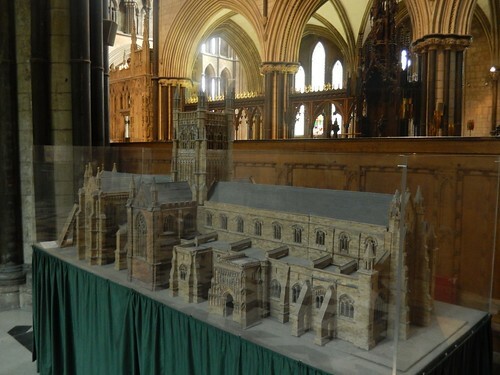 A scale model provides a full a true representation of its size. 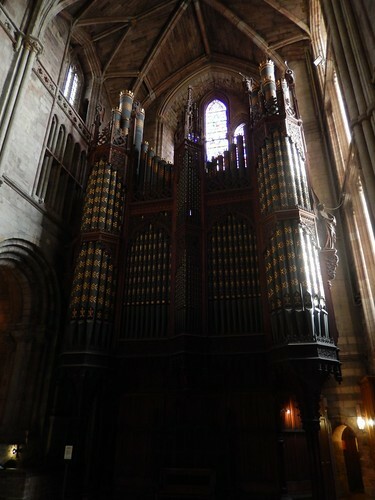 Somehow, I felt it looked smaller from the outside and, after stepping in, it seemed huge. 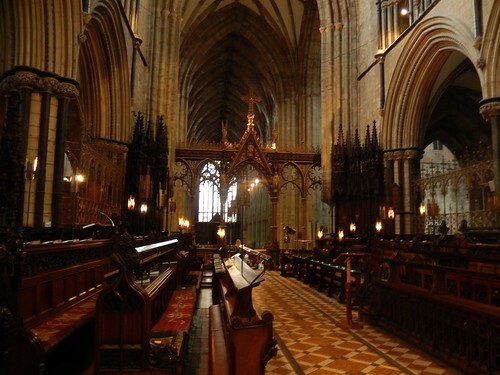 We’d entered to the sound of ‘eerie’ organ music playing, with atmospheric lighting in select areas. 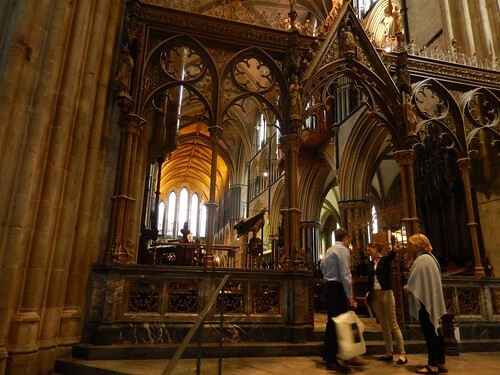 I couldn’t recall finding the same experience at the ever-popular cathedral in Salisbury. 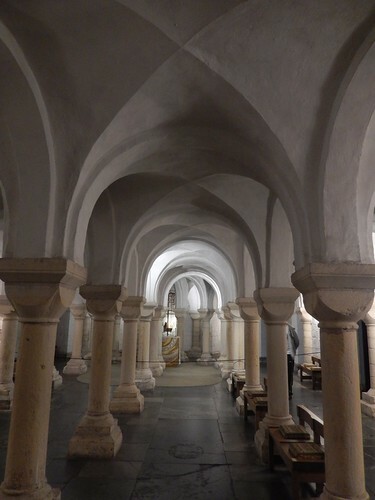 Down beneath us, was The Crypt. A very well-lit area that’s free to explore. 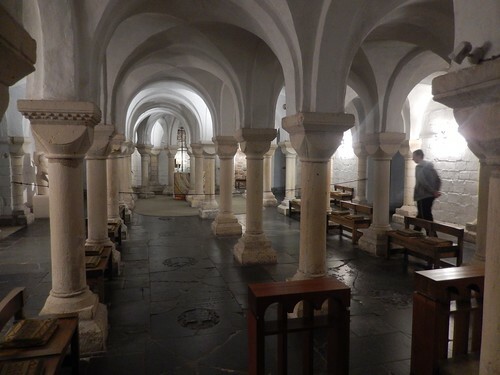 I’d only previously been down in the crypt beneath Gloucester Cathedral – that was nearly five-years ago and I’m hoping to revisit, one day – there, the space is unlit and you have to queue up for a guided tour. 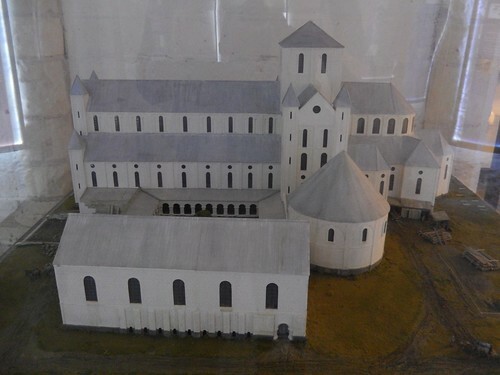 I would guess that this model represents the original priory? I could be wrong. I didn’t question it at the time. 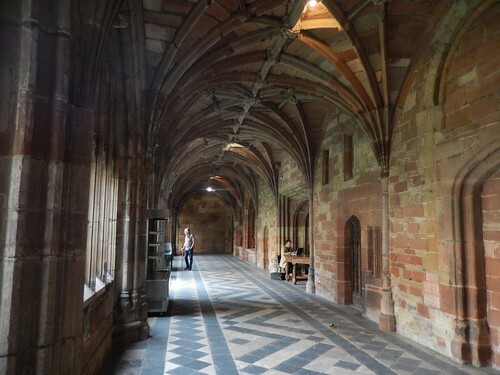 Outside, the medieval cloisters surrounded a garden area (minus the humanoid-rabbit wire-sculptures, as seen elsewhere). 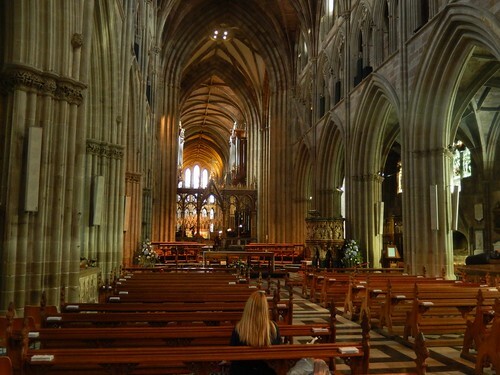 So, that’s Worcester Cathedral, in a nutshell. There’s no strict admission charge – although, donations are greatly appreciated. There are even self-service style machines where you can donate by card payment. As I said earlier; we’d arrived at a time when much of the city was closing – the market stalls had already begun to pack up as we made our way back to the car. 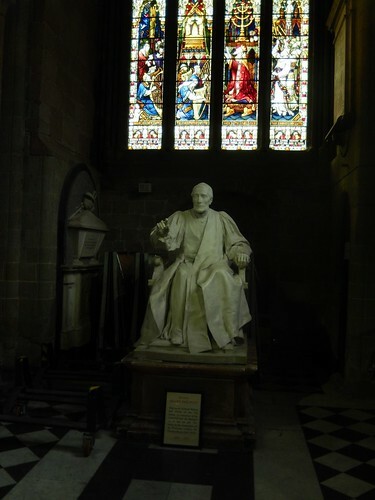 Also, we hadn’t fully researched the city and what else it might have been able to offer… It looks now, as though we might’ve missed a couple of museums – but then, they could also have been closed or close to shutting up. Something to think of for next time. 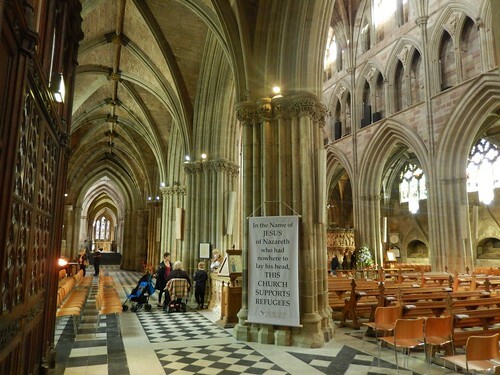 I remain under the impression that Worcester Cathedral – and its city, in general – is less popular and less frequented than others, including Salisbury and Wells… Which, in my opinion, is a very good thing for anyone who is planning a visit… Something I do highly recommend.